Can't decide on which of our salts to get? Want to try an assortment? Then this sampler set is for you. 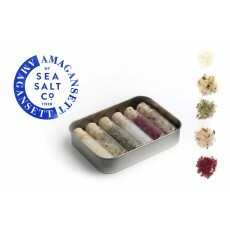 Each small tin contains six corked glass vials, each filled with 5-grams of a different one of our sea salts. One vial will be our Pure Sea Salt; the other five will be a random assortment of our flavored and infused blends. The tin doesn't hold enough salt to keep your kitchen going for many meals, but is the perfect way to - you guessed it - sample a variety of our salts. It's also the perfect solution to that oh-so-wonderful bistro with the great views and fabulous ambiance, but whose food always needs a bit more seasoning to bring out flavors. Makes a nice gift too! We got the idea for this from a chef in New York City we regularly supply. We frequently experiment with new blends and infusions and bring samples in small vials to chefs for feedback. On one visit, the chef took out a tin of mints, shook out the mints and put in the vials of salt we just gave him, explaining that he was flying home to Paris the next day on vacation and the salt would be perfect for his trip. Voilà! Fits easily in a pocket or purse. 3.75" x 2.75" x .75"